These top rails are made with the same material as our aluminum posts, but with a rounded shape, perfect for running your hand along. Lacking the angles of a traditional rectangular top rail, this makes for a softer, smoother appearance. This section also contains corner pieces, splices, two different compatible end cap options, and more; Everything you might need for a shaped aluminum top rail. Available in black, bronze, natural, clay, or white like all our aluminum products. Combine this top rail with our ALUMINUM POSTS. 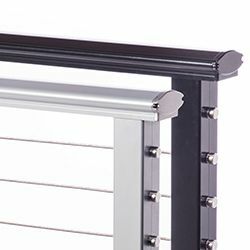 This material is also available as a RECTANGULAR TOP RAIL or POST-TO-POST RAIL, which can be used as a handrail or as inline support for one of our WOOD TOP RAILS.